VANCOUVER -- The British Columbia government is expanding the bighorn sheep hunt in part of the Cariboo region at the same time it targets the animals' natural predators to protect two herds in a move one conservation group is calling "astounding." For the first time since 1993, open hunting of rams with full curl horns is allowed in the Taseko Lakes area of the Cariboo. In the neighbouring region around Churn Creek southwest of Williams Lake, the province has contracted the cull of wolves and coyotes to protect two sheep herds in decline. "Predator-prey dynamics are complex, and the ministry doesn't make predator management decisions lightly," the Ministry of Forests, Lands, Natural Resource Operations and Rural Development said in a statement. Bighorn sheep are a blue-listed species in B.C., which means they are not immediately threatened but are a species "of concern" because they are particularly sensitive to human activities or natural events. The provincial wolf management plan says the government does not support predator control for the purpose of hunting ungulate populations, which would include the sheep. No one was made available from the government to speak about the issue. The statement from the ministry said the cull was necessary to protect two unique migratory herds, one of which has only eight members and is at risk of extinction. The other herd has 29 animals and the goal is to increase populations to 50 sheep with a minimum of 25 to 30 adult ewes, it said. 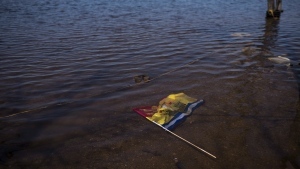 The ministry said it expects "positive results" in three years. Predator removal is not being used in any other part of the province to manage bighorn sheep populations, it said. Since 2016, 13 wolves and five coyotes have been "removed" within the Churn Creek area. Freedom of information documents obtained by the Wolf Awareness show the contractor was hired to "capture and collar" predators with a contract that permitted him to shoot, trap, snare, hunt with dogs or kill cougars, coyote and wolves. In the neighbouring lands around Taseko Lakes, hunting season opened Sept. 10 and runs through Oct. 20. The hunting area was expanded this year because provincial biologists say the Taseko sheep population recovered to 106 in 2016, after dipping to 53 in 2012. The province says even if all the rams with full curl horns were killed, enough older rams would remain in the population for breeding purposes. 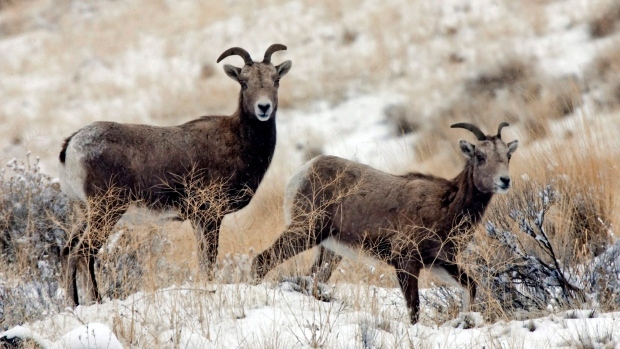 Hunting for bighorn sheep in the Churn Creek wildlife management area has been closed since 2012. However, the two herds could be vulnerable if they wandered into adjacent lands. Sadie Parr, executive director of Wolf Awareness, said predators like wolves, coyotes and cougars are not the biggest threat to the sheep and the province's decision to remove them is representative of a broken wildlife management system. "To me, this is predators being scapegoated. It's an easy thing to do to make it look like you're helping a species recover when there's no evidence behind this," Parr said. "That is astounding to me for a variety of reasons." The B.C. Conservation Data Centre identifies primary threats to the species as habitat loss, livestock ranching and harassment by the public. Bighorn sheep are also vulnerable to stress and stress-related disease and predators are not mentioned as threats in the centre's 2015 conservation status report. Parr said removing predators from an ecosystem either by killing or relocating them can have trickle-down effects on other species. It could mean changing the sheeps' grazing habits, for example, which would in turn affect the plant life in the area, she said. "Predators have an incredible and extremely important role in maintaining functioning ecosystems." Parr said it would be more effective to target human caused threats to the species. "The reality is you're doing nothing to recover or preserve this species if you're still damaging their habitat and if you're still hunting a dwindling population," she said. The provincial government has been criticized in previous years for a wolf cull it launched in an attempt to recover endangered caribou herds. While government officials argued in 2015 that the experimental cull was the best shot at protecting caribou from extinction, environmental groups and celebrities including Miley Cyrus and Pamela Anderson denounced the hunt as unethical.